RWE did already clearcut most of the part they wanted to cut this year. Also the area of the old occupation is cutted already. 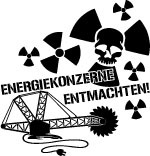 But now RWE have to stop cutting because of suit from the BUND – the german freinds of the earth. 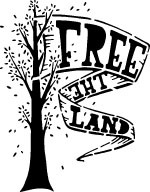 The suit is against the land, because they gave RWE the permision to cut, what is against the law of species conservation. 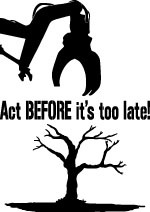 RWE have to stop cutting until the court decided about the suit. Yesterday activists from the evicted forest occupation gathered for the 4th time in front of the police station to reclaim their stuff which was left in the forest during the eviction. They destroyed all of this because in their view it was “rubbish”. 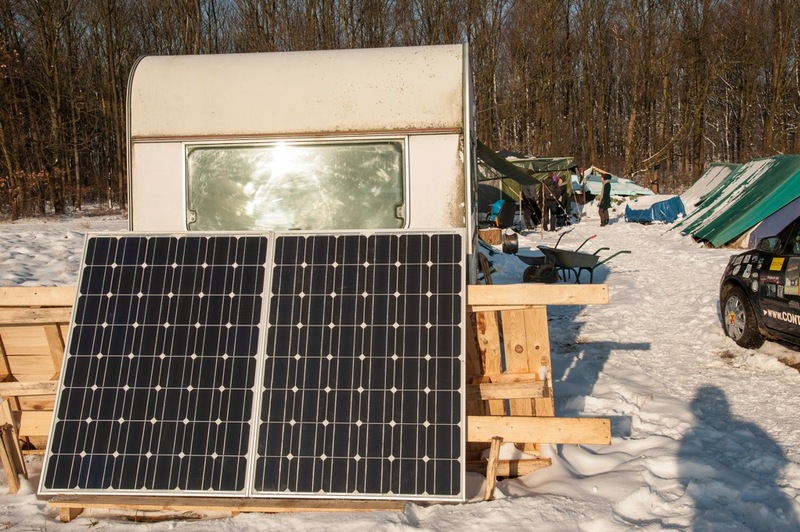 While the police is saying that they have to save the private property of RWE (the energy company that owns the forest), they give a damn about other property like ours. We need this stuff for the cold winter time and sure they knew this. This is another example for the obiediance of the police to RWE. They ensure the profits of a greedy few against the needs of most of the people which is land, warm clothes, sleeping-bags in winter and a planet to live on. RWE is destroying all of this. But we are lucky to have so much support from the locals who are affected from the open cast mines. 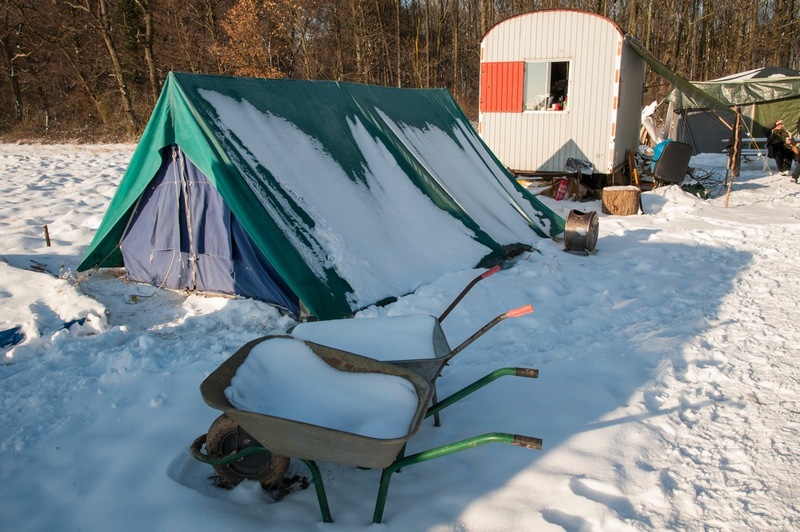 They aready donated a lot of warm clothes, blankets, tents, building material and also helped to build huts that we can remain in winter on our new occupation. Another great achievement ist that also local people are changing their minds about the police and buisness owned media which were telling lies during the eviction. There will be cofee and cake, like every sunday at 2:00 pm. And “Klaus der Geiger” a well known artist in this region will give a concert. Since we are at the new occupation, there are a lot of people from nearby visiting us. For the next sunday also the lokal resitors group “Buirer für Buir” is inviting to come to the new occupation. IF THE GOVERNMENT GETS ITS WAY, ARE WE LIKELY TO SEE MORE ‘MOTHBALLED’ OPENCAST SITES POCK-MARKING OUR COUNTRYSIDE? The hidden topic so far, in all the discussion about the Energy Bill is what will be its impact on the UK Coal Industry. This is a much shrunken industry, producing around 18m tonnes of coal a year. Last year 59% of that coal was produced by opencast methods. This year, as the deep mining sector continues to suffer from problems and cost pressures are closing mines (on a temporary basis) at Maltby and Aperpergwm and Daw Mill, our largest pit is almost certain to close, domestic coal production is becoming ever more reliant on surface mining – in the July to September quarter, of the 4m tonnes of coal the UK produced, 65% now came from surface mines. Love and greetings to Glenn Collins, Matt Almonte and everyone supporting them and other tar sands blockade actions! Direct action is necessary to prevent companies like TransCanada and RWE from devastating the planet. It feels great to see that across the Atlantic others are taking the same means to fight in the same issues as we do. 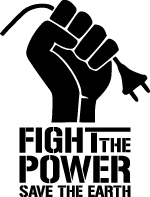 Global warming, environmental damage and the industries causing them are international – and so is the resistance of energy struggles! Our fight here in the Rhineland is against RWE, one of the four electricity monopolists in Germany and major energy supplier Europe-wide, and against the massive destruction they are dealing out for lignite extraction and combustion: In the Rhenish Brown-Coal Mining District (the dirtiest carbon dioxide emitting structure of Europe), more than half of the energy produced in five power plants is fed back directly for the operation of the three giant open cast mines – again, the largest of Europe. For their permanent extension, RWE regularly resettle villages, dump some of the most fertile farmland of Germany via conveyor belts, and now restarted clearing the Hambach Forest, one of the last primeval forests left in densely settled Mid-Europe. But before that, they had to evict us – on November 19th, after four days of eviction, police wrenched the last activist out of a tunnel – a form of action newly introduced in Germany; we greatly recommend it! Guess the several concrete Lock-Ons in the treetops also annoyed them a lot… Seems like the police in Texas are as reckless as those in Germany – here as there they repeatedly endangered and threatened the lives of the ones locked on. Here as there they sent activists off properties, where they were tolerated by the owners. 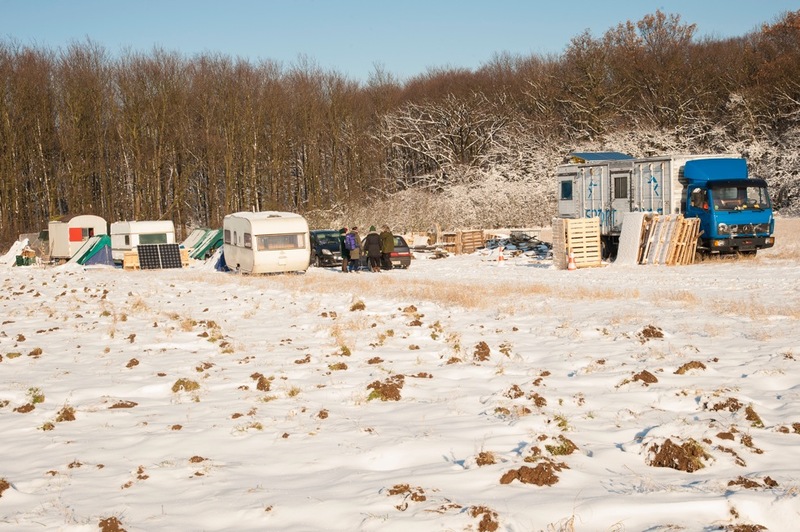 Here they even arrested the owner, before he was able to clarify that he possesses the field from which they were trying to evict the re-occupation! But repression backfired: The re-occupation is thriving with even more amazing local support than the first one. Congratulations to your great invention of pipeline concrete lock-on blockades. This must really annoy them! And you know as we do, whatever they threaten you with – they can’t risk to injure you! Stand strong, we are hoping for you. And we are curious how they will try to fix this. Energy struggles must be one united fight on a global scale. Whether against tar sands, brown coal or nuclear power – the fossil energy sources and the power and economic systems they stand for need to be fought back in order to save this planet! The land grabbing and devastation they recklessly burden the people with cannot be tolerated! And the more repressive they fight back, the more we will become. The time to rescue this planet is running out, but in Texas, the Rhineland, in Colombia, Scotland and so many other places in the World, we are taking action to conserve our livelihood. 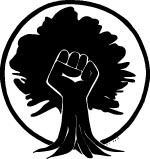 The system is global – and so are we! In Winona, Texas, two acitivists have locked themselves to concrete barrels they carried into the end of an oil pipeline under construction. The action was part of a massive protest movement in the USA confronting TransCanada, the company extracting oil from tar sands in Canada and building a pipeline for transporting it througout the US. Tar sand oil is even more toxic than regular crude oil, and at the place of the action, the pipeline would be less than a hundred feet from residetial houses. For the extraction of tar sands in Canada, primeval forests the size of the UK are devastated into a toxic desert. The process taking the oil out of the sand doesn’t even make any sense – more electric energy needs to be spent than the oil brings back. The economic reason for that is the lack of crude oil for the large indutries depending on it. And again, the resource addiction of the economic system is valued higher than anything alive. Both activists were wrenched out of the lock-ons violently risking serious injuries. Police pulled so hard, the the chain on the wrist of of them broke. Glen Collins and Matt Almonte, who were locked in, and Isabel Indigo Brooks who supported them inside the pipe, are now in custody (according to the latest info). They are all being charged with three misdemeanors: resisting arrest, criminal trespassing and illegal dumping.